In 5 to 6-quart Dutch oven, cook ground beef, onions and bell peppers over medium-high heat until beef is thoroughly cooked, stirring frequently. Drain. Stir in pepperoni, olives, pizza sauce and tomatoes. Reduce heat to medium; simmer 5 minutes, stirring occasionally. Spoon 2 2/3 cups of the beef mixture into each of four 4-cup freezer/microwave-safe containers. Cool 30 minutes. Cover; refrigerate up to 3 days or freeze up to 2 months. Thaw 1 container of beef mixture in refrigerator for 24 hours, or uncover and thaw in microwave on Defrost for 10 to 15 minutes. To heat refrigerated or thawed beef mixture, cover loosely and microwave on High for 6 to 8 minutes or until thoroughly heated, stirring once or twice. Toast 8 English muffin halves. Spoon and spread about 1/4 cup hot beef mixture onto each muffin half. Immediately sprinkle with cheese. For more pizza flavor, substitute 1 pound Italian sausage for 1 pound of ground beef. Cook as directed in the recipe. 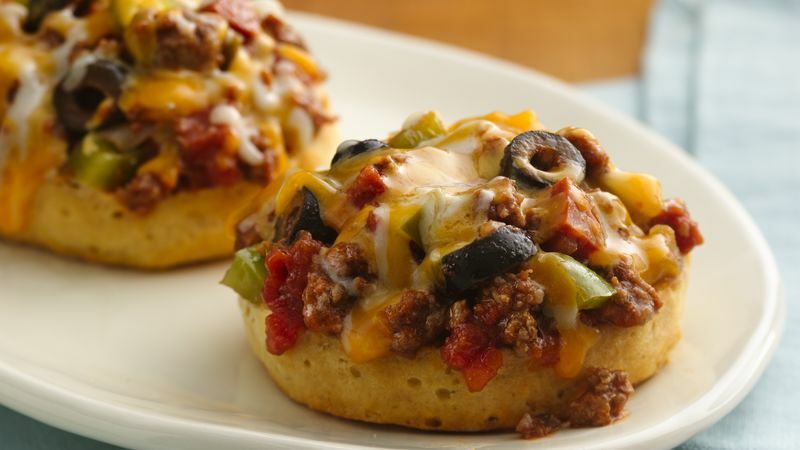 To make this easy to assemble at mealtime, freeze the English muffins and the cheese along with the sandwich topping. Put the desired number of muffins and cheese in separate freezer plastic bags; label and freeze. Thaw the English muffins at room temperature and the cheese in the refrigerator.